Action Comics faces some of the same challenges as Detective Comics, that even as these were the original flagship titles for their respective characters, the main story with each character tends to happen in the titular books and not in these companions. 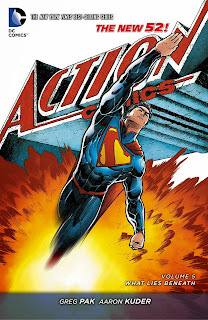 In the New 52, Action Comics has mostly itself to blame for secondary status, given three volumes of Grant Morrison's story that all took place five years before the present action. Those were enjoyable books, but they set Action as the "background book"; that Vol. 4 offered just one story in Andy Diggle's abbreviated run, also set in the past, with the rest of the book telling a tale in service to Scott Lobdel's Superman: Psi War, only continued to reinforce this. Five volumes down the road, then, Action Comics Vol. 5: What Lies Beneath is arguably the first "real," modern-day Action Comics volume written and drawn by what appears to be a creative team that intends to stick around (if Greg Pak and Aaron Kuder's presence post-Convergence is any indication). In just one volume, Action will be sucked again into the larger Superman ethos with Doomed, but these pages are Pak and Kuder's own. What entails is a wonderfully madcap, yet sensitive, self-contained story, not even itself entirely safe from the demands of other titles, though Pak navigates it all and still tells his own story like a pro. What Lies Beneath kicks off with the Superman Secret Origins Vol. 1 story that I'd read before, followed by Action #25, a crossover with Batman: Zero Year. That's not a great start for a book that includes only five regular issues, now down to four. But Pak is smart about it, and as it turns out what seemed like a somewhat ordinary Superman origin from Secret Origins actually previews certain events and has resonance later in What Lies; Pak's origin story stands alone well enough to have convinced me it was actually stand-alone, but it also contributes mightily to the tapestry of What Lies. In high concept, What Lies Beneath is a "big monster" story; Superman battles an array of sharp-toothed creatures and other denizens of a newly-discovered subterranean city. This is entirely in artist Kuder's wheelhouse, late of drawing Green Lantern: New Guardians's strange aliens, and the kind of sci-fi story where Superman fits very well. But Pak also humanizes the story to a great degree, both in his use of Lana Lang, Clark Kent's long-time friend who both does and doesn't understand how Clark has changed with his responsibilities as Superman, and also in Pak's paralleling the rampaging monster/misunderstood little boy Baka with Clark's own struggle to control his powers as a child. Pak's story literally ranges from bizarre ancient cities all the way to rural Smallville, and it's a Superman story that uses the entirety of the character well. Pak posits Lana Lang as an adventuresome electrical engineer, a somewhat arbitrary choice made for the demands of the story but better, surely, than the crazed jealous stalker-Lana, and no less arbitrary than when Lana suddenly became CEO of LexCorp. In the New 52, Clark and Lana did have a childhood romantic relationship and Clark did tell Lana about his powers, but Pak makes early mention of Superman's relationship with Wonder Woman, establishing Clark and Lana's current interactions as mostly platonic. DC makes an interesting choice in pairing Superman and Wonder Woman; to tie either to the other would seem to limit story potential (and must one day end disastrously), but conversely it's opened new avenues for the characters of Lois Lane and Lana Lang. No longer married to Superman, Lois spends less time on relationship issues and petty jealousies and more time being a trusted friend and advisor to Superman; similarly Lana is a fun, sarcastic presence here who sees Clark through Superman's bravado, even if her "Lana Lang, Action Hero" antics are sometimes too outlandish to be believed. Again, Aaron Kuder has a broad, animated style that works perfectly for the story Pak is telling. The monsters are great, but also Kuder draws a lovely underwater scene in the Zero Year issue complete with a magnificent wind-tossed whale. I might have begun to feel there were too many splash pages toward the end, but just as I did, Kuder delivers a two-page spread of almost twenty panels that helped balance the score. His Lana also looks like a real person, neither egregiously buxom nor rail-thin, which reinforces her as a tie to Clark Kent's "normal life" in contrast to Wonder Woman and his other superheroic friends. I'm eager to read the Superman: Doomed stories, including Action Vol. 6 (though at this point I'm impatient to get through Doomed, Futures End, World's End, and Multiversity so I can start reading Convergence), but I'm equally curious about the collection after that, when it seems Greg Pak and Aaron Kuder will get to tell their own stories again. In Action Comics Vol. 5: What Lies Beneath, this is a good team telling good stories, and I'm glad they're sticking around and eager to see what they'll do next. Later this week, Teen Titans Vol. 5: The Trial of Kid Flash! Well, I truly loved Morrison's three volume-run on Action, and nothing afterwards has been able to top that imo. This volume had some entertainment value, but not enough for me to add it to the collection, and vol. 6 (and Superman/Wonder Woman vol. 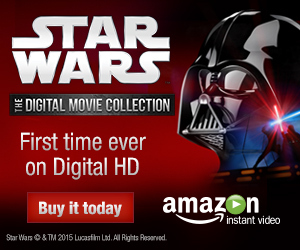 2) I'll just skip and get the big Doomed collection instead. The Horrorville storyline that will comprise vol. 7 is a post-Doomed story that's entertaining and ends on a great note, and one can only hope they include isue 40 as well, as that is one truly funny issue. If Action keeps doing what it's doing now I'll consider starting to pick it up again. What Lies Beneath should have led the Superman 52 launch. Add the team of Pak and Kuder to the very special list of creators who truly understand Superman.